Named after the David Cronenberg film, this is the blog of former RogerEbert.com editor Jim Emerson, where he has chronicled his enthusiasms and indulged his whims since 2005. Favorite subjects include evidence-based movie criticism, cinematic form and style, comedy, logical reasoning, language, journalism, technology, epistemology and fun. No topic is off-limits, but critical thinking is required. 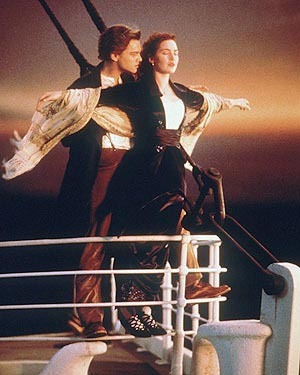 Their hearts will go on, even if they're all wet. 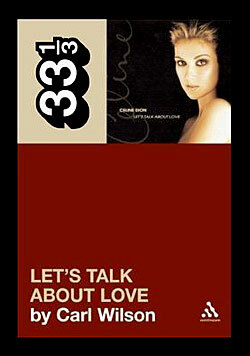 It's called "Let's Talk About Love: A Journey to the End of Taste," by Toronto Globe and Mail pop music critic Carl Wilson, and it critiques a Celine Dion album. The one with the "Titanic" love theme on it. Well, kind of. If you've been following posts and discussions around these parts recently ("Moviegoers Who Feel Too Much," "Are Movies Going to Pieces?," "Don't let this affect your opinion of Juno..."), you'll know why that title immediately grabbed my attention. And it's not because I'm a Celine Dion fan. I don't know that I've ever heard a Celine Dion song besides the "Titanic" one (he said, attempting to stockpile some cultural capital) and I must admit: My first thought when I decided to check out the book was that I couldn't buy it, or even be seen leafing through it, at a local bookstore because I'd be appalled if anyone saw me. Even someone I didn't know. In the next moment I was even more ashamed that I'd felt that fear of shame. Taste'll do that. Wilson’s reading of philosophy, social theory and his own conscience pretty conclusively demonstrates that the revulsion Dion inspires in the cultural elite is a function of class. We like what we like because of our social circle and education and cultural and economic prospects, and we dislike most intensely that which we perceive to be beneath our station. Wilson has plenty of points of disagreement with Bourdieu (and so do I), but he notes that "even if Bourdieu was only fifty percent right -- if taste is only half a sub-conscious mechanism by which we fight for power and status, mainly by condemning people we consider 'beneath' us -- that would be twice as complicit in class discrimination as most of us would like to think our aesthetics are." And isn't that what frequently happens with our cultural interests — that the most significant thing about them, often, is how they mutate into other interests? You start out getting interested in blues through the White Stripes, say, and then a year later you find that what's really sending you is early African-American fiddle records, and within months you're reading books on the history of the minstrel show, realizing uncomfortably that half the campfire songs you ever knew (the half that weren't written by Woody Guthrie) started out being sung by white men with black cork smeared across their faces. Well, yes it is, and we can all trace our own similar meandering pathways through movies, music, art, science, history. It reminds me of... researching and writing and publishing a blog, where a (self-)examination of one preoccupation leads to another and another and another. What you end up doing is challenging yourself endlessly, pushing yourself to get to the root of how you think you understand something, to go where you find yourself feeling most reluctant to go, and to articulate what you find out -- which often amounts to more questions and challenges. I like New York in June How about you? I like a gershwin tune, how about you? I love a fireside when a storm is due. How about you? "The New Dictionary of Cultural Literacy" says it's from the latin proverb: De gustibus non est disputandum, so I guess that's who. This was too weird and funny not to share: I was informed this weekend by a dubiously reliable source, that my book was leafed through briefly on the campaign bus last week by Barack Obama, who made some joke to the effect that it sounded like I felt about Celine the same way he feels about Hillary. It was the Celine/Hillary connection that prompted him to pick it up in the first place, after a campaign volunteer (the guy who told me the story) left it lying around on the bus. Notice how I mixed up "I," "one," "we," "us"? I'm unsubtly trying to get you to identify with me. Biggest Acting, Best and Worst: Over the top, Ma!